Immerse yourself in everything Cody and Wyoming has to offer at Walking Deer Cabin. 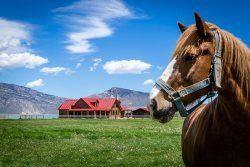 The cabin shares 15 acres with the owner’s homes and is surrounded by larger ranches, providing stunning views of surrounding mountain ranges, the South Fork valley, and the Buffalo Bill Reservoir. It’s just minutes from world-class fishing, hunting, birding, hiking and museums at the Buffalo Bill Center of the West. The Cody - Yellowstone airport is only 30 minutes away. Comfort - Walking Deer Cabin sleeps 4 to 6 (4 adults or 2 adults and 4 children) and has both heating and central air conditioning. It features a full bath, kitchen with dining area, and a deck with outdoor furniture. A high chair and Pack-n-Play are available for families. Convenience - Included is a TV/VCR/DVD player, high-speed Wi-Fi Internet connection, outdoor propane BBQ, and enclosed garage. The cabin is 12 miles from Cody and the highway to the east entrance of Yellowstone National Park. Unique sense of place - The cabin is one of three dwellings on the property set within an oasis of ash, cottonwood, and a vast variety of pine trees. Much of the property is sheltered from the occasional strong Wyoming wind. Wildlife - The abundance of trees attracts migrating birds and notable local residents. Eagles regularly appear, as do sandhill cranes and great horned owls. A family of redtail hawks nest just beyond the property line. While bears have not been seen on the property, plenty of deer and antelope wander by, along with an occasional coyote. Big horn sheep and elk can be viewed within a short drive down the valley. In short, Walking Deer Cabin is the perfect destination for nearly every getaway. Absolutely beautiful property & wonderfully peaceful. It was all we were hoping for and more! Quite the lil jewel if in the Cody area.. Cabin was equipped way better than I expected.. The owners of the property were very friendly and helpful. Close enough to everything but still far enough out to feel the peacefulness and enjoy the serenity of the scenery..
Everyone we spoke with on the phone was very helpful and very courteous. We will definitely use your company again for accommodations if we come to Cody again. The cabin was well stocked and very clean. We were very pleased with the property. The view was absolutely gorgeous and we loved how it was so quiet at the property. We got to see lots of wildlife each day in our yard and the field behind the cabin. It is in a very beautiful location, everywhere you looked the view was stunning. The morning we woke to snow on the ground was an extra pleasure we really had not expected. It's hard to pick a favorite because it all was wonderful and the surrounding grounds of the property are so well kept that it enhanced the beauty. One of our favorite sights were the deer we saw every day, there were herds of them all around us. Overall our stay was wonderful and I would recommend this cabin to anyone seeking a place to stay near Cody, Wyoming. This cabin was in a beautiful area with a location near our destination. It made a good base to use while exploring Yellowstone. There were many pluses to staying in this cabin, but there is also a long way to go on overall cleanliness and comfort versus cost. I am not sure we would stay here again. We wanted a home base for the week so we could explore Yellowstone yet save on food and get a good night's sleep each night. This was a good location, as Cody was so close. The family living on the property was so nice, and the view was amazing! Highly recommended. I appreciated that there was an on-call person had we needed anything. We had an absolutely wonderful time. The cabin was so cute and perfect for what we were looking for. When we come up to Cody again we will stay at the Walking Deer Cabin again. Thank you, it was a wonderful experience. The team was easy to work with and answered all our questions before our trip. Our stay was great.The views from the cabin were wonderful.The only problem we had was the distance we had to drive to get to Yellowstone.It is a good hour to get there and over several days that does get tiring. Erika was great to work with. - A $39 damage insurance provides $3,000 in damage protection during your stay. You may decline this charge, but will be assessed a minimum $250 refundable deposit.